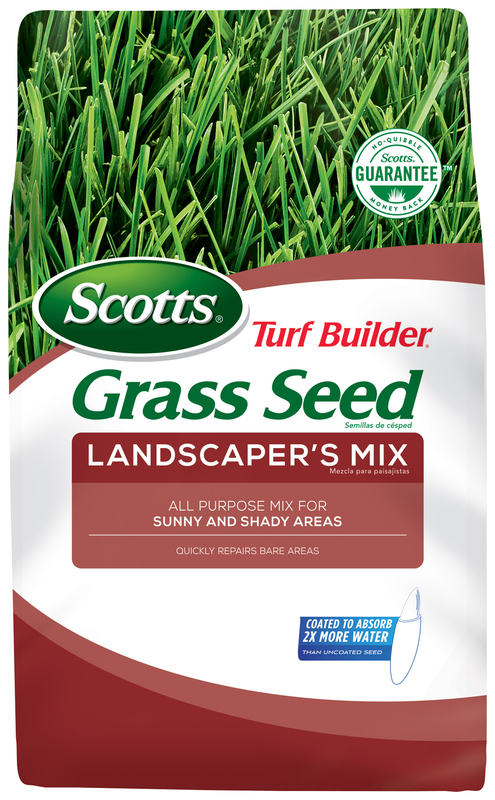 Scotts® Turf Builder® Grass Seed Landscaper's Mix is an all-purpose mix for sunny and shady areas. This 99.9% weed free seed has been blended specifically for the Northern region. Just prep the ground, apply the seed and water according to package directions. In no time at all you'll have a beautiful yard, thanks to Scotts® Turf Builder® Grass Seed Landscaper's Mix. For best results, apply Scotts® Turf Builder® Starter® Food for New Grass when seeding to help new grass grow in quicker and thicker. - (AccuGreen, Classic Drop) - Set to 8 ½ for reseeding and reseeding and set to 12 ½ for new lawn/bare spot repair. - Set to 5 for reseeding and for new lawn/bare spot repair, set to 5 and go over lawn twice.